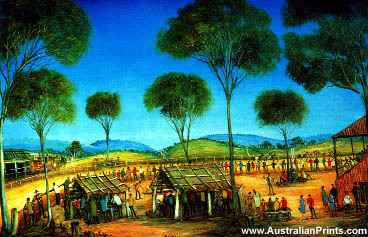 Pro Hart was a world renowned Australian artist and one of the most popular contemporary artists of our time. Kevin Charles “Pro” Hart, MBE (30 May 1928 – 28 March 2006), was an Australian artist, born in Broken Hill, New South Wales, who was considered the father of the Australian Outback painting movement and his works are widely admired for capturing the true spirit of the outback. Pro Hart is a household name in Australia, a world renowned artist and one of the most popular contemporary artists of our time. With an individualistic approach which encompasses the primitive, naïve and impressionist schools, his art reflects the character of Australia. With the vastness of our outback, its harsh landscapes and deep silence, the long white sandy beaches and city people at work his paintings capture a history of Australia, its people and their lifestyle. Born Kevin Charles Hart in Broken Hill on 30th May 1928, his early years were spent on the family sheep property ‘Larloona Station’ near Menindee. His interest in art surfaced at an early age, preferring to write with his brush rather than his pen. As a young man Pro Hart worked as a miner during the day and captured his images of Australia on canvas at night. Virtually a self-taught artist, his first recognition by the art world was in 1950 when he won several competitions and a major turning point in his career followed with his discovery by the director of Adelaide Art Gallery. Nicknamed Pro – a symbol of his remarkable talent – his first exhibition was a sellout. Since then Pro Hart has exhibited all over the world in cities such as London, New York, Paris, and Tokyo. In addition, he has illustrated several books. In 1976 Pro Hart was awarded the distinction of Member of the British Empire by her Majesty the Queen in recognition of his service to art in Australia. Kevin Charles “Pro” Hart, MBE was born in Broken Hill, NSW on 30 May 1928. The “Pro” comes from being nicknamed “Professor” during his younger years. 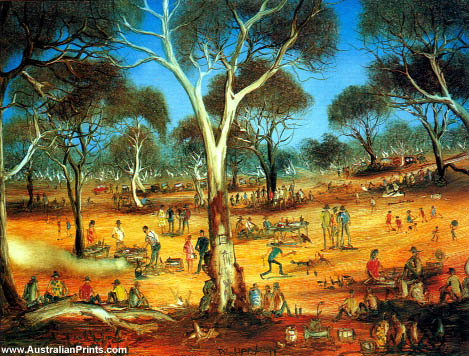 According to Wikipedia, Pro Hart is considered the father of the Australian Outback painting movement and his works are widely admired for capturing the true spirit of the outback. Pro Hart typically painted with oil or acrylic, his subjects depicting scenes of rural town life, topical commentary and some religious subjects. Pro was also a sculptor, working with welded steel, bronze and ceramics. Pro Hart developed novel artistic techniques including Cannon Painting and Balloon Painting and even used his own DNA to aunthenticate his paintings. Pro Hart was afflicted with motor neurone disease in his later years and died on 28 March 2006. He was buried in the Broken Hill cemetery. Some of Pro Hart’s most famous paintings include: Judas with Kite (1962), Dragonfly (1967), Ant Nest (1979), Miner Waiting For His Clothes To Dry (1983), Death of Saul (1987), The Pale Horse (1990), The Fabians (1991), There Was Movement At the Station (1995), Oil Can Harry, and Self Portrait. Pro Hart’s art works are featured in International Collections in the U.S.A. Europe, Middle East and Hong Kong, as well as in National Collections at the National Gallery of Australia in Canberra, The State Gallery in Hobart, Tasmania, the University of N.S.W., Macquarie University, N.S.W., The Art Gallery of N.S.W., The Sydney Opera House, State Gallery of South Australia and other collections. Artist information page for Pro Hart. This article uses material from the Wikipedia article Pro Hart, which is released under the Creative Commons Attribution-Share-Alike License 3.0.